THURMOND, James Strom, a Senator from South Carolina; born in Edgefield, S.C., December 5, 1902; attended the public schools; graduated, Clemson College 1923; taught in South Carolina high schools 1923-1929; Edgefield County superintendent of education 1929-1933; studied law and was admitted to the South Carolina bar in 1930; city and county attorney 1930-1938; member, State senate 1933-1938; circuit judge 1938-1946; served in the United States Army 1942-1946, in Europe and in the Pacific, and participated in the Normandy invasion; was awarded the Purple Heart; major general, United States Army Reserve; Governor of South Carolina 1947-1951; unsuccessful States Rights candidate for President of the United States in 1948; unsuccessful candidate for the Democratic nomination for United States Senator in 1950; practiced law in Aiken, S.C., 1951-1955; appointed as a Democrat to the United States Senate to complete the term of Charles E. Daniel, who resigned, and served from December 24, 1954, to January 3, 1955; had been previously elected as a write-in candidate in November 1954 for the term commencing January 3, 1955, and ending January 3, 1961, but due to a promise made to the voters in the 1954 election, he resigned as of April 4, 1956; again elected as a Democrat on November 6, 1956 to fill the vacancy caused by his own resignation and took the oath of office on November 7, 1956; reelected in 1960, 1966, 1972, 1978, 1984, 1990 and 1996 and served from November 7, 1956, to January 3, 2003; was not a candidate for reelection in 2002; changed from the Democratic to the Republican Party on September 16, 1964; President pro tempore of the Senate (January 5, 1981-January 5, 1987, January 4, 1995 to January 3, 2001, January 20 to June 6, 2001); President pro tempore emeritus (June 6, 2001-January 3, 2003); chair, Committee on the Judiciary (Ninety-seventh through Ninety-ninth Congresses); Committee on Armed Services (One Hundred Fourth Congresses); turned 100 years old on December 5, 2002, while still in office, the oldest person ever to serve in the U.S. Senate; awarded the Presidential Medal of Freedom on January 12, 1993; died in Edgefield, South Carolina on June 26, 2003; interment in Willowbrook Cemetery in Edgefield. Cohodas, Nadine. 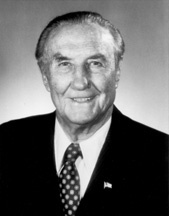 Strom Thurmond & The Politics of Southern Change. Macon, Ga.: Mercer University Press, 1994; Crespino, Joseph. Strom Thurmonds America. New York: Hill and Wang, 2012.